Place 1 lettuce leaf on each of 4 salad plates. Place 1 pear half, cut side down, on each lettuce leaf. Cut prunes lengthwise in half with scissors and remove pits. Place 1 prune half on large end of each pear half for dog ear. Cut cherries in half with scissors. Place 1 cherry half on narrow end of each pear half for dog nose. Scoop out tiny hole in each pear half for dog eye. Place raisin in each hole. 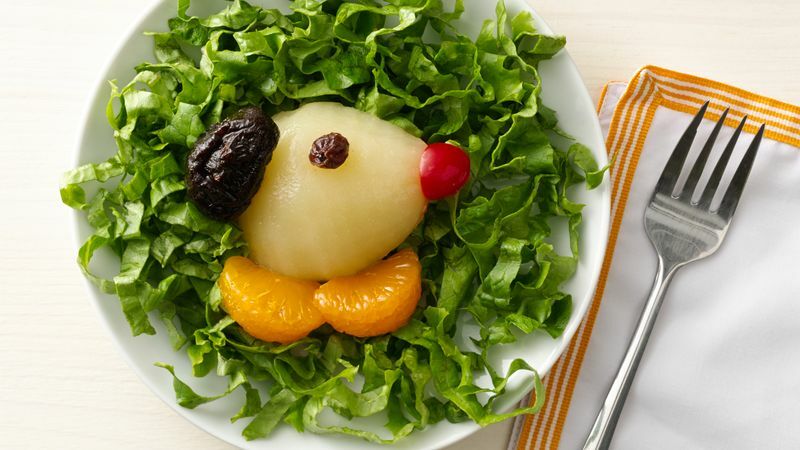 Add 2 orange segments to each salad for a collar. Spell success when kids eat the fruit salad they got to make! Fresh pears? You bet. Just brush them with lemon juice to prevent them from turning brown.